Alle Kurse des Schweizerischen Rafting-Verbands werden gemäss den Ausbildungs-Anweisungen der International Rafting Federation IRF durchgeführt. Das erfolgreich abgelegte Schlussexamen gibt Anrecht auf die Internationale IRF Zertifikation, welche in sechzig Ländern bekannt ist, Schweiz inbegriffen. ACHTUNG ! Wir feiern ! 5) Erneurung First Aid mit CPR ??? NEW THROW BAG TEST ! The „throw bag test“ is used to test a GTE candidate’s ability to perform a swimmer rescue using a rescue throw bag. The test must be performed under a specified time limit so that the candidate experiences time pressure similar to conditions that approximate an actual rescue. • The test is performed using (2) two swimming “victims”. Candidates shall take turns rotating as rescuer and victim until all candidates have been tested. • Each rescue attempt is timed. • The timing begins when the 1st Swimmer is signaled by the Instructor to enter the main current. • Using a throw bag, the rescuer must perform an accurate throw, and then successfully retrieve the 1st swimmer from the main current. • After the 1st Swimmer is retrieved from the current, the rescuer must immediately prepare the rescue rope for a 2nd throw. • 25 seconds after the timing began, the 2nd Swimmer is signaled by the Instructor to enter the main current. • The rescuer must accurately throw the recoiled rope to the 2nd Swimmer and retrieve them from the main current, and then make direct “hands-on” contact. • At the moment of hands-on contact, the timing will stop. • The entire rescue sequence should be performed in 1 minute 30 seconds or less. The Instructor may allow additional time if the features of the selected site make this necessary, however all candidates being assessed together must be tested using equal conditions. 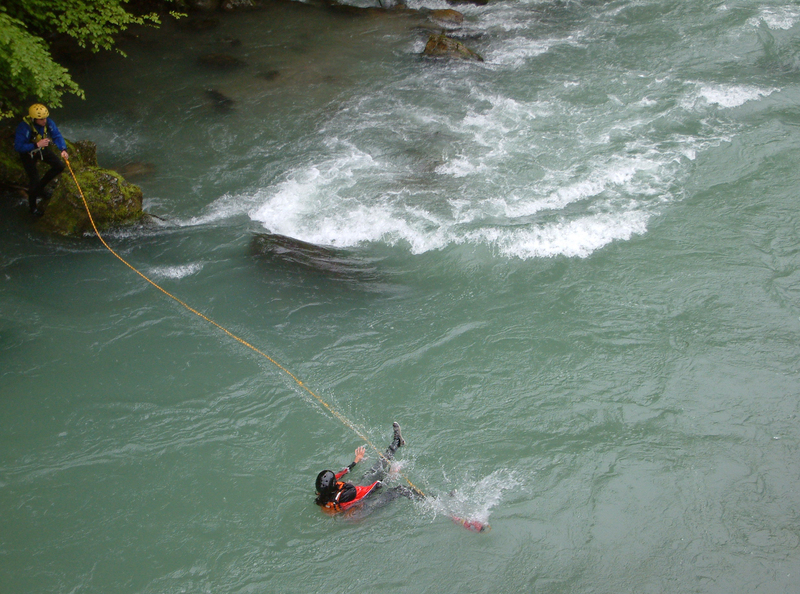 • If the Instructor observes that the rescuer has made an inaccurate throw to either swimmer, OR that the rescuer has employed a technique that could harm the rescuer or the victim, OR the rescuer is handling the rescue rope in an unsafe manner, the rescue attempt will immediately end. Candidates are allowed a maximum of (3) three attempts at passing the throw bag test during the assessment. • Perform an accurate throw (within arm’s reach) to both swimmers. • Retrieve the 1st swimmer from the main current. • Retrieve the 2nd swimmer from the main current into a safe location AND make hands-on contact. • Maintain control of the rescue rope in a safe manner at all times. • Finish the test within the allotted time period. • The test site must be located on a section of river or swift water channel that contains fast moving current, and must not contain hazards that could endanger swimmers. • The current should be capable of carrying a swimmer past the rescuer at a distance of approximately 10 meters from his/her stationed position, taking into consideration the length of the rescue rope used so as to not make the distance of the throw unreasonable. • When the timing begins, the rescue rope must be inside of the throw bag (not already opened in hand). • When using personal throw bag systems, the bag must be stowed according to the bag type / delivery system. (i.e. waist bags must be stowed on the waist, PFD bags stowed inside of their pocket, etc. ). • Swimmers should enter the main current a minimum of 20 meters upstream of the rescuer so that they have accelerated to match the current speed when they reach the rescuer. • Swimmers must position themselves so that they will pass approximately 10 meters off shore from the rescuer’s station. • The swimmer must simulate a victim in distress – inattentive, tired, and frightened. • The swimmer should not acknowledge the rescuer or grasp the rescue rope in the correct manner unless verbal and/or whistle contact has been established and instructions given. • If the swimmer receives an inaccurate throw, the test will end and the swimmer should immediately exit the river. In no case should the victim assist the rescuer by swimming towards a rescue rope that was thrown out of reach. • If the swimmer receives an accurate throw and is given verbal instructions by the rescuer, he/she should grasp the rescue rope and perform as directed by the rescuer.